My eldest son has just graduated high school, and we threw a large party at our house the other day for the family and and friends of our family and his friends. As a surprise, I wrote a heartfelt yet slightly sarcastic song for the group of “Boys” who have known each other for many years. 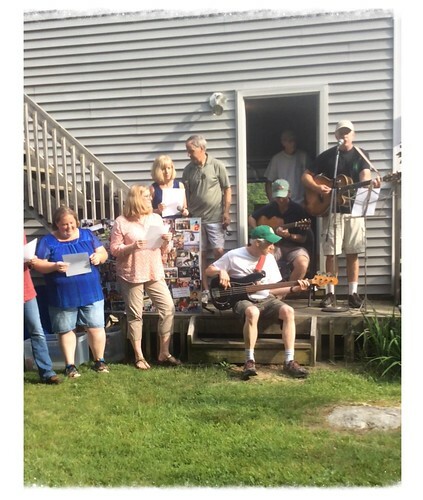 A group of parents (and my dad, at the last minute, got on the snare drum) came together to rehearse the song (well, we rehearsed once), and then, we performed it for them at the party. This entry was posted in Homepage. Bookmark the permalink. I always love how music infuses your life. Such love here. Such fun. The right tone I suspect for “these boys”. These Dads, Grandad…. so creative!!!!!! What fun you had prior to the party and during, Kevin. Creative, innovative boys the world awaits you!